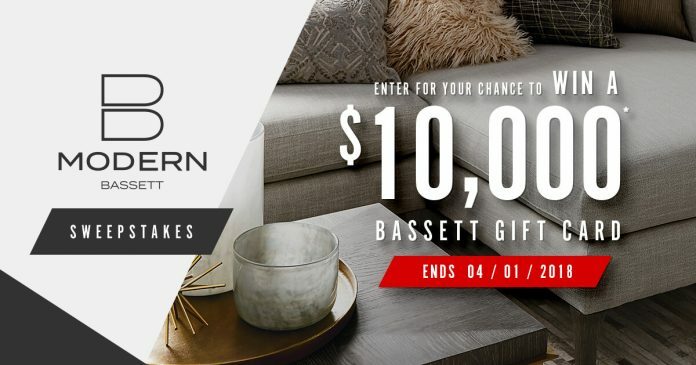 Now through April 1st, visit www.bassettfurniture.com/sweeps and enter the Bassett Furniture Sweepstakes for a chance to win a $10,000 Bassett Furniture Gift Card. One lucky winner will be randomly selected on April 3 and will receive $10,000 in gift cards to Bassett Home Furnishings store. What Is The Bassett Furniture Sweepstakes? The Bassett Furniture B-Modern Sweepstakes is a new Gift Card Sweepstakes sponsored by Bon-Ton Department Stores. The Sweepstakes is open only to legal residents of the 50 United States or the District of Columbia who are 18 years or older and reside within the delivery radius of a Bassett Home Furnishings store location throughout the Sweepstakes Period and awarding of the prize. Starts at 7:00 a.m. (CST) on March 1, 2018. Ends at 11:59 p.m. (CST) on March 31, 2018. Vsit www.bassettfurniture.com/sweeps during the Promotion Period. Complete the Sweepstakes entry form in its entirety. Check the box to indicate you are over the age of 18. Cick the “ENTER NOW” button to receive one entry into the Sweepstakes. There is a limit of one entry per Entrant/email address per day. Entrant must enter each day to receive an entry each day. One prize of a $10,000 gift card to Bassett Home Furnishings store will be awarded to the Prize Winner. Prize Winner must redeem his/her Bassett Home Furnishings gift card at a Bassett Home Furnishings store by May 27, 2018. Total ARV of the Prize to be awarded is $10,000.